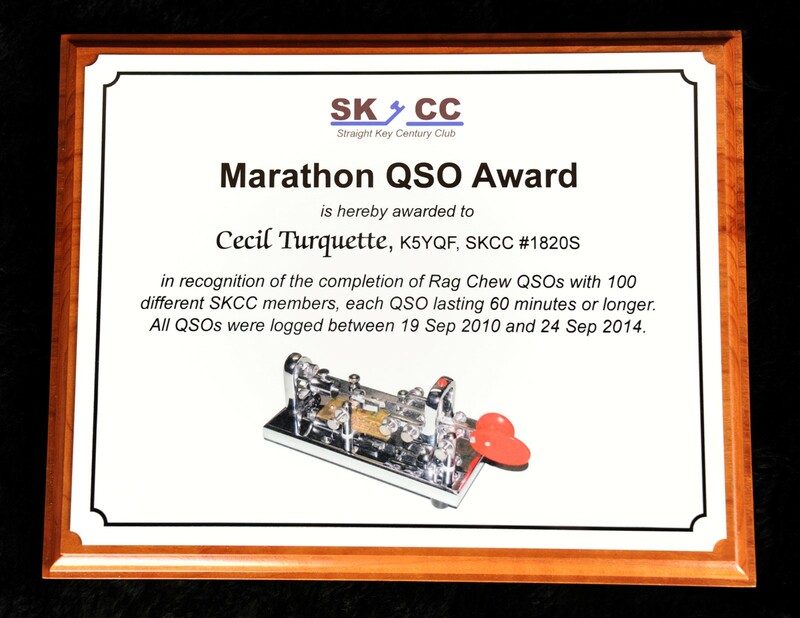 To earn the Marathon Award, one must engage in 100 QSOs, each 60 minutes or longer, and each with a different SKCC member using SKCC qualified keying devices. There is no time limit to earn the award but only QSOs logged after 0000Z 1 January 2008 count. Members who achieve the Marathon award will receive a special commemorative plaque or coin (yet to be decided) and a certificate suitable for framing. Rationale: Create a true operating challenge that involves the fundamental ideals of ham radio as celebrated by SKCC: operating skill, a good station, conversation skill, and a consistent, quality fist. Create an award that cannot be achieved easily or quickly yet promotes quality content in every contact. The Marathon Award requires people to actually ragchew. Ragchews build camaraderie and long-term friendships. These are ideals worth working for. The Marathon Award has been deliberately designed to be the most challenging achievement ever devised for Amateur Radio Operation. Ragchewing is an art. Anyone can send a brief exchange in a few seconds and move on. Engaging the other station in an extended, informative, and entertaining exchange for a lengthy period requires real skill, a quality station, and a creative mind. The intent of the Marathon Award is to recognize these rare and special talents with the highest level of ragchewing recognition ever created. Few will be able to earn this award. Initial funding for this award and for its first two years has already been secured. Donations may be solicited in the future if needed. 1. Both parties to the QSO must send an email "QSL" to the award manager, Cecil Turquette, K5YQF, at marathonmanager@skccgroup.com showing the date, time, frequency band, both call signs, and duration of the QSO. When a member reaches 100 QSOs lasting 60 minute or longer in the database, he or she will qualify for the award. A suitable announcement will be published, the commemorative will be prepared, the certificate printed and everything mailed to the operator. 2. Participants must use straight keys, sideswipers (cooties), or bugs. See the club's policy on acceptable keys here. To see each participant's latest log, visit the entrants' log page here.